ITALY HAS THREATENED to prevent vessels flying under foreign flags from disembarking migrants rescued in the Mediterranean in its ports, a source close to the government said. “We can’t go on like this,” the source told AFP after media reported that Italy’s representative to the European Union, Maurizio Massari, delivered a letter to the bloc warning that the country was considering closing its doors. 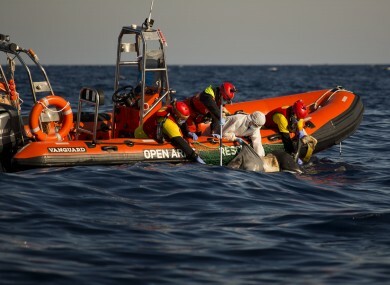 Massari is said to have met the European Commissioner for Immigration, Dimitri Avramopoulos, to insist that the latest wave of people saved from rickety vessels in the Mediterranean had meant “the situation has become unsustainable”. Prime Minister Paolo Gentiloni said Italy was “asking certain European countries to stop looking the other way, because we cannot go on like this”. The anti-establishment Five Star Movement (M5S), which is running neck-and-neck in national polls with the PD, has followed the Northern League in demanding a stop to new arrivals — particularly in the capital Rome. “I wonder whether the proposed measure is legal at all,” said Mattia Toaldo, an expert on Libya at the European Council on Foreign Relations. “Denying docking rights to ships who have rescued people in distress at high seas (a legal obligation for all vessels, including commercial ships) sounds dubious. “It sounds more like a desperate way to get Europe’s attention than a real measure that can be implemented,” he said. The NGOs have already faced a fierce campaign to discredit them this year after an Italian prosecutor alleged their collusion with smugglers — an accusation they said was political and designed to thwart their rescue efforts. Email “Italy threatens to close its ports to foreign ships that rescue migrants from the sea”. Feedback on “Italy threatens to close its ports to foreign ships that rescue migrants from the sea”.